How does Fitbit's smartwatch help you pump iron? After spending the last couple of weeks strapping on the Apple Watch and hitting the gym to see how it fared as a companion, it was time to take the Fitbit Ionic for a spin. With Apple having had over two years for developers to flesh out its Watch app store, it was no surprise that a range of apps were available and ready to help me log exercises, weight and reps. However, I was in search of a piece of wearable tech that could provide a little more insight with less of the legwork. And after a week's worth of sessions with the Ionic, well, it's fair to say there's definitely less legwork. Unfortunately, this is for all the wrong reasons, despite Fitbit offering a dedicated mode for strength training. Instead of this giving you the ability to add exercises or count reps, as you might expect from a specific section, this is a barebones tracking experience – heart rate, time elapsed, calories and, oh no, wait, that's literally it. Yes, instead of fleshing this out to compete with or better its rivals, Fitbit has essentially given you the equivalent of what you'd receive in an 'Other' section of most tracking apps. Now, obviously, with the Ionic only releasing earlier this month, I already knew there wasn't going to be anything to write home about with regard to third-party apps, but I'm struggling to see why – besides simply ticking a box – Fitbit bothered including this mode at its current level. Of course, it's never steered toward strength training before, so it's perhaps unreasonable to expect anything more than the simplistic, steps-focused hub centred around the basics. Either way, this doesn't feel like a priority and, put simply, can't be considered a serious option for those looking to keep track of their progress in the gym. On the bright side, Fitbit Coach does serve up three solid exercise run-throughs for your core – 10-minute abs, 7-minute workout and Treasure Chest. Since a quick ab session is hard to track any way other than following a routine, I've mainly been utilising the 10-minute ab hit over the past week. It's a nice way of keeping you engaged with the Ionic, since an instructional pop-up is present during rest periods, but it's also fair to question why there's not more of this kind of thing from the get-go. This could so easily be applied to strength training. One thing that is a step up from the Apple Watch experience is the constant heart rate display during your workout. Obviously tracking heart rate and zones isn't as helpful when lifting weights as it is when you run, but, as we can see from the after-workout feedback below, the spikes are indicative of the entire sessions' sets. Disappointingly though, there's no option to name your workout (i.e. 'chest and triceps'), making it hard to cross-reference workouts and spot any trends. So, with all this in mind, there's now a decision to make – whether to stick with the Fitbit for another week or to move on to potentially greener pastures. I do feel as if I've exhausted the extremely limited weights tracking the Fitbit Ionic has to offer, and, even worse, it's slightly affected how I approach hitting the weights. While I knew what my routine was with the Apple Watch and could mindlessly follow along on screen, this essentially means I have to remember a full workout like a regular schmuk. Still, for the purposes of comparison in the long-run, it's worth forging on and bearing with the Ionic for another week. Only this time, I'll be using more wearables on the periphery to help it along and speaking to a physiotherapist about how best to utilise a plan around the tech. 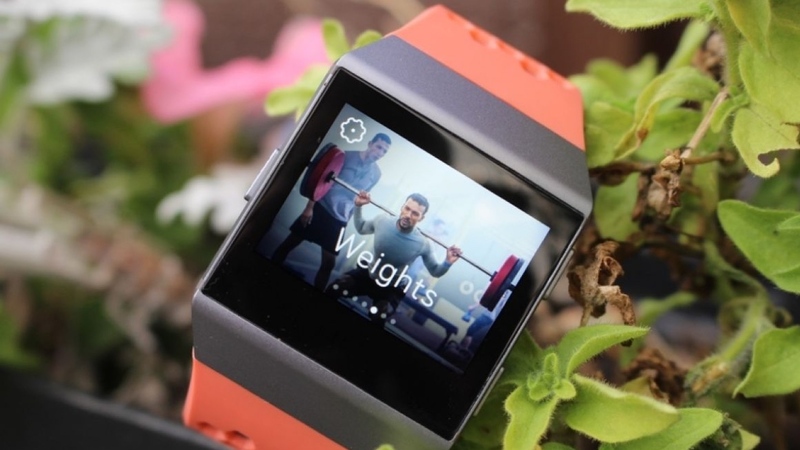 If Fitbit could begin working on adding more support in the meantime, well, that'd be grand.